With the beginning of spring comes sunny days, blooming flowers and baby animals. 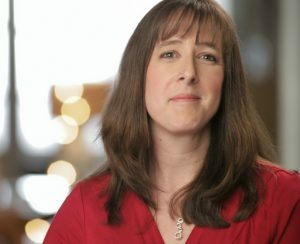 It is one of my favorite times of the year and it inspired me to get crafty and make this easy rainbow craft to share with you all today. My husband has a bucket in the garage where he tosses his bottle caps so bottle cap crafts are easy for me to get supplies for! Since we are heading into Earth Day, I loved the idea of an upcycled craft that was not only pretty but functional as well. We all need more refrigerator magnets, right? 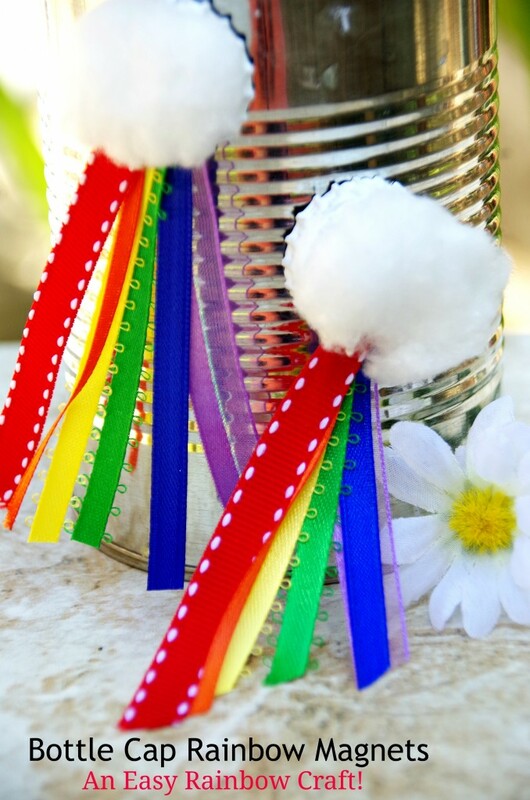 If you are looking for an spring craft idea to share with your kids, this easy rainbow craft should be a big hit! I am including a few affiliate links to the supplies I used in this craft if you are inspired to shop! 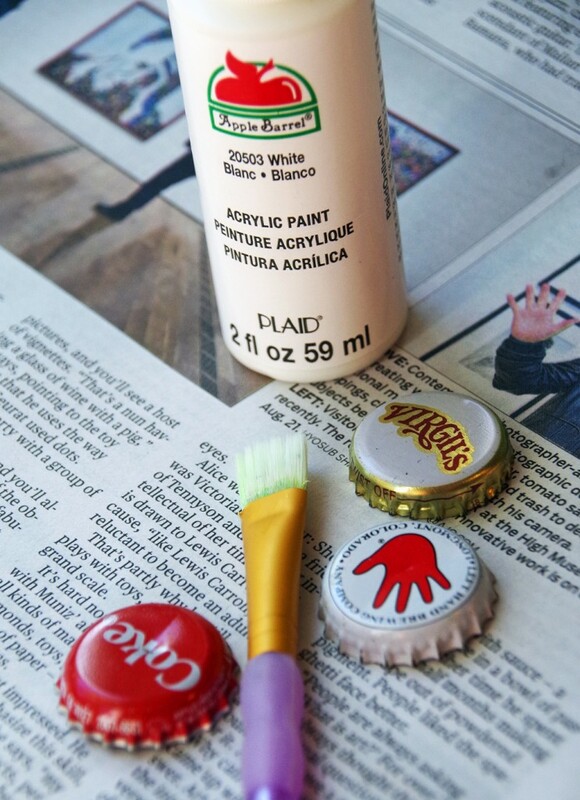 Place your bottle caps on a piece of newspaper and paint them white. You can skip this step, although you may see the edge of the magnet in the finished craft. Once the bottle cap is dry, flip over and hot glue the small magnet inside the cap. 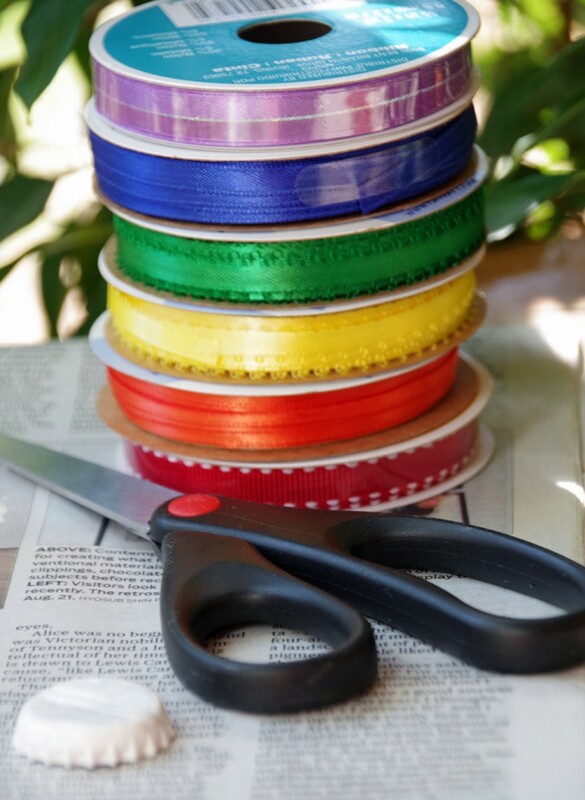 Cut your ribbon to the desired length. About the length of your index finger (a few inches long) is about right. Hot glue the ribbon in the correct order to the top of the bottle cap. Red, orange, yellow, green, blue and purple. You can use the scissors to cut the edges at an angle to make it more decorative if you want. 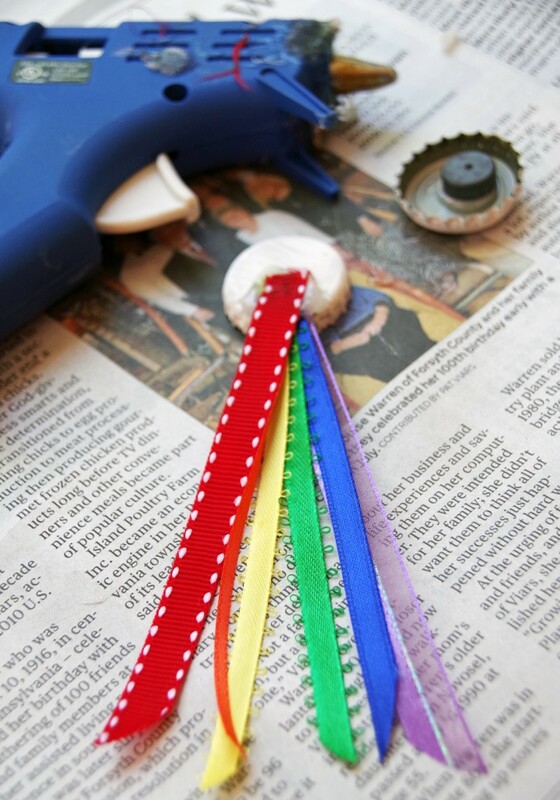 Once the glue is dry on the ribbon, glue the cotton ball onto the top of the bottle cap. Your easy rainbow craft is now finished and can be placed on your refrigerator or any magnetic surface! 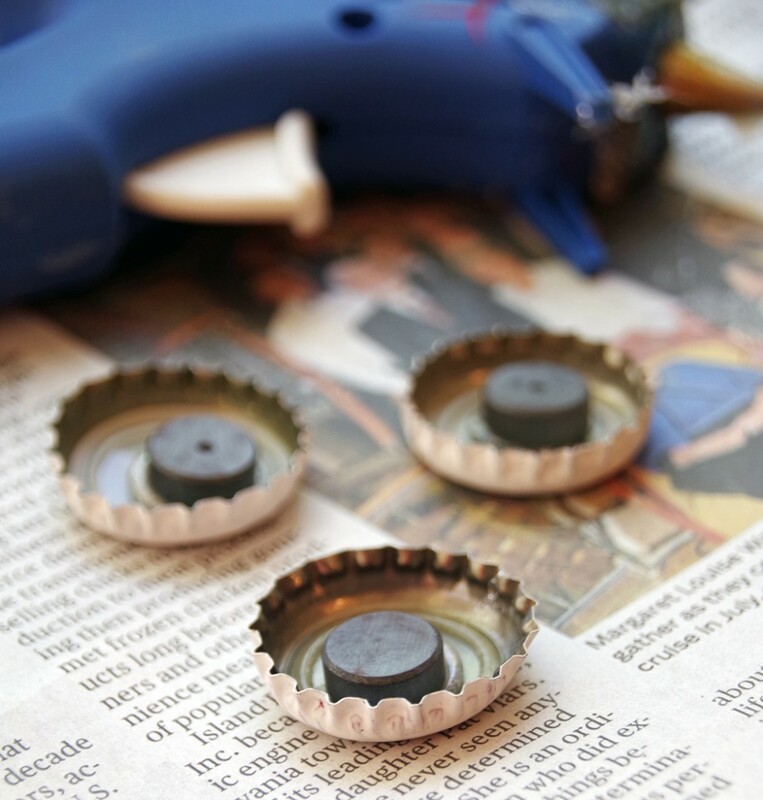 Have you ever tried any bottle cap crafts? Love upcycled crafts? 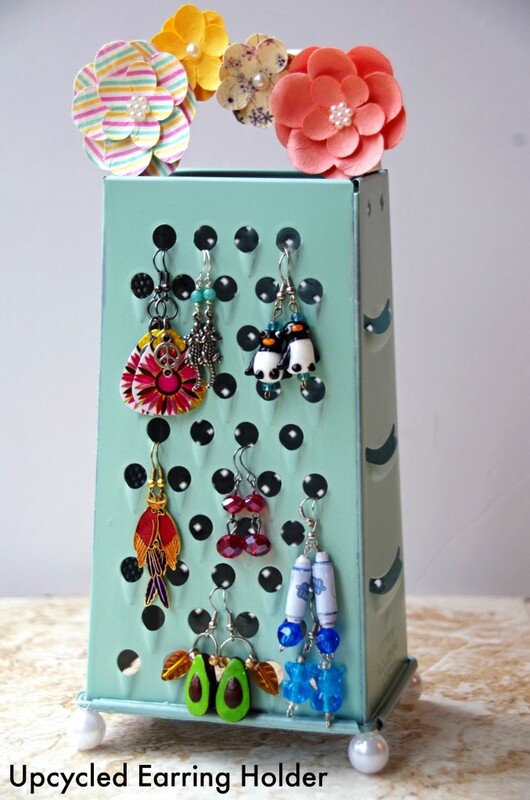 Make this Cheese Grater Earring Holder! I love upcycled crafts because that means that most of the stuff can be found around my house. What a fun colorful rainbow! What a cute craft idea! I love upcycling items! These are so cute! My kids are home this week for Spring break and they would love to make something like this. Thank you for the idea!